This article is part of the Shogo Sub-Section and is not to be confused with the Blood Wiki proper. This article outlines the various factions in Shogo: Mobile Armour Division. "Andra Biomechanics, founded in Moscow in the early 21st century by Natalya Andropov, a renowned researcher on the Human Genome Project, grew to specialize in a variety of genetic engineering, cybernetic, and mechanical engineering interests. Their products included medical bioengineering technologies, cybernetically assisted prosthetics, and even anthropomorphic mobile engineering vehicles (MEVs) used in construction, mining (terrestrial and otherwise), and demolition. They also did early research and development of mobile combat armor (MCAs) and armaments." Andra Biomechanics is a Russian based firm founded in the early 21st century by Natalya Andropov, a renowned researcher on the Human Genome Project, which was one of the founding companies behind the UCA. It specializes in various forms of genetic, cybernetic, and mechanical engineering, and was one of the earliest developers of what would become known as MCAs. Other Andra products include medical bioengineering technologies, cybernetically assisted prosthetics, anthropomorphic mobile engineering vehicles (MEVs) used in construction, mining, and demolition. These vehicles would prove to be the templates for the modern MCA. 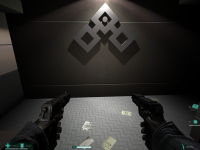 Armacham logo as seen in the later Monolith game F.E.A.R. "Armacham Technology Corporation got its start with the manufacture of commercial satellites and ground-based communication systems. Eventually, they would expand to encompass civilian and military vehicle manufacture, musical equipment, security systems, and, predictably enough, MEV and MCA technologies. Their MCAs (they discontinued their MEV lines after some early experiments) immediately caught the attention of the private sector and various military organizations alike. Sleeker and sexier than the offerings of their competitors, Armacham's MCAs were and still are considered the most striking MCAs available. Of course, form without function is useless, and Armacham delivers there as well. While not as rugged as Andra MCAs or as sophisticated as Shogo MCAs, Armacham's designs are reliable and hardy." Armacham is the third founding corporation behind the UCA which started out building commercial satellites and communications systems. They would later expand into a number of different enterprises including military vehicle manufacture, musical equipment, security systems, and also the development of their own types of MCA and MEV systems, although their MEV attempts were cancelled soon after they began. Their MCA line proved to be a success however, producing sleek and aesthetic MCAs that contrasted well against the powerful units built be Andra and the more sophisticated machines that came out of Shogo Industries. "Since it was founded in 1964, Armacham Technology Corporation has become a leading aerospace/defense contractor, with revenues approaching 8 billion dollars and almost 60,000 employees worldwide. The company specializes in satellite technologies, ground-based communications, and advanced weapon systems." --Radio news description of Armacham as it appears in the later Monolith Productions title F.E.A.R. "Shogo Industries, a Japanese conglomerate, had interests ranging from technology to publishing to the manufacture of children's clothing. With the advent of MEVs and MCAs, Shogo decided to offer their own highly advanced line of giant mechanized suits. Their designs were well received both for functionality and aesthetics. They also distinguished themselves for space-based product lines and microcomputer technology." A Japanese company notable for its own brand of MCA, and its long standing alliance with the U.C.A under Ryo Ishikawa. It is later found to be attempting to manipulate all sides of the Cronus conflict in an attempt to gain control of Kato and Cothineal for their own ends, under Ryo's guidance. Sanjuro later takes on Ryo's Shogo forces in both endings and destroys their plans. Shogo's corporate presence has been described to being akin to those of a Zaibatsu, holding control of large number of industries (publishing, children's clothing, MCAs, space-based product lines, microcomputer technology, etc) while also having a strong amount of commercial independence. "The UCA, originally intended as a joint venture that would ensure the continued profitability and expansion of the three organizations that founded it, took on a life of its own almost immediately. With its status as the primary regulatory agency for interstellar commerce, the UCA quickly swelled into an unwieldy bureaucracy. It was only after dissociating itself from its progenitors that it was able to restructure itself and become more efficient, simultaneously forming the United Corporate Authority Security Force (UCASF), which would soon become the dominant military power in existence. Within a decade, it was involved in the manufacture of deep space vessels, aircraft, ground-based vehicles, and MCAs. While the UCA's early entries in the MCA market were poorly received, subsequent models, especially the Defender and Enforcer, rank as some of the best MCAs available." The United Corporate Authority (U.C.A) monolithic corporate and military conglomerate founded from by a succession of companies (Shogo, Andra, and Armacham) to front space travel and exploration. The group soon took on a form of its own and became the dominant corporate and military power in the galaxy. It still remains in contact with its founding corporations, namely to take advantage of their products for their military such as the various Mobile Combat Armours. The United Corporate Authority Security Force (UCASF) soon entered into the Cronian Revolution once it had started feeling the blow of the militant Fallen. The UCA is also responsible for the creation of both the Defender and Enforcer MCA types, as well as some deep space vessels, aircraft, and ground-based vehicles. "By the time the revolution began in earnest, the Cronian Mining Consortium (CMC)-the governing body on the planet-had long been eager for autonomy from the UCA and various corporate interests. The importance of kato energy gave the CMC a powerful bargaining chip offset only by Cronus' military insignificance. So the CMC began bolstering its military in secret, aided by a covert treaty with Andra Biomechanics. The UCA was aware of the buildup, of course, but Akkaraju was instructed not to interfere for reasons that were not shared with him. Unfortunately, Akkaraju's superiors had apparently underestimated the extent of the CMC's efforts. A sizable mercenary fleet arrived in the system a mere two standard hours before the CMC officially proclaimed its independence and issued its terms. The UCA was hit unprepared and forced to retreat from Cronus' high orbit under heavy fire. For the next 18 months, the UCA executed a series of covert operations designed to undermine the Cronian resistance by removing key individuals. Although the overall success rate of these missions was marginal at best, the plan eventually succeeded and the Cronians agreed to negotiate an accord. [Later] with the CMC hobbled by its own partial collapse and a fanatical army preparing a massive and potentially apocalyptic assault on Maritropa, the situation had changed dramatically in a short amount of time. Neither the UCA nor the CMC considered abandoning Cronus (or Coth, as the Fallen called it) a palatable option. But the CMC was no longer capable of defending itself. They could hold out for a while, but ultimately they would fall." Cronian Mining Consortium (C.M.C) is a mining block created to promote the industry of Kato mining on Cronus. Akin to the U.C.A it soon took on a management of its own, secretly building up a sizable military force with the aide of Andra Biomechanics thanks to a covert treaty. They soon took control over much of Maratropa and began fighting as one of the dominant factions during the Cronian Revolution. In either Shogo ending the C.M.C surrenders. "It was around this time that a terrorist group calling themselves the Fallen surfaced. Their initial attacks were designed to undermine UCA faith in the CMC and, indeed, delayed the treaty process by several months. Once the existence of the terrorists was established, the CMC requested UCA assistance in rounding up the faction... The Fallen, meanwhile, grew stronger and more organized. Military intelligence attributed the transformation to a new leader elected to replace Ivan Isarevich, who was killed in the Avernus incident. The new leader, known only as Gabriel, rallied the historically fragmented Fallen into a fighting force capable of posing a serious threat to the CMC... Final proof of the Fallen's viability came mere hours after they seized a remote but well defended CMC geological station. The CMC's military fragmented, nearly a third of its soldiers declaring loyalty to Gabriel and the Fallen." The Fallen are a group of what appear to be religious fanatics. They formed an organized military even containing modern warfare equipment including Mobile Combat Armour. Their members often refer to others as "Heretics" and shout in a strange tongue. It is later revealed that the Fallen are actually formed to front the interests of a then unknown Cronus native super being known as Cothineal who is the secret source of Kato, and one who is trying to regain freedoms accidentally stolen from it by the colonizers. One of the former leaders of the Fallen was Ivan Isarevich who seemed to have been also more of an "up and coming tyrant" out for power as well as a representative of Cothineal; he was assassinated by U.C.A forces (namely Sanjuro, Toshiro, Kura, and Baku, all of which except for Sanjuro were thought to have been lost during the affair. The next leader of the Fallen who regrouped and reorganized it was known as "Gabriel", who turned out to be Toshiro under the control of Cothineal. Baku also joined the ranks of the Fallen under Cothineal's influence, becoming Gabriel's right hand minion Uziel. In option one the Fallen are significantly damaged by Sanjuro, though humanity still strives to gain peace with Cothineal. In option two they are victorious via gaining a truce agreement with the U.C.A and the surrender of the C.M.C. In this ending Toshiro remains as Cothineal's ambassador on Cronus and the Fallen and the U.C.A negotiates for the future of the planet. "The swift military rise of the Fallen on Cronus is attributed to the leadership of a man known only as Gabriel. Following the death of Ivan Isarevich, the original leader of the fanatical terrorist group, Gabriel rallied the historically fragmented Fallen into a fighting force capable of posing a serious threat to the Cronian Mining Consortium. Here is an extract from a public statement issued by Gabriel to the population of Cronus and the various interests in orbit around her: 'We, the fallen children of earth, our ancestral home, are the rightful heirs and stewards of Coth. We will tolerate no further exploitation of her bounty, no further taking of her gifts. Those who oppose the will of Coth shall be expunged. Those who leave will do so with our blessing. Those who remain will perish.' Final proof of the Fallen's viability came mere hours after they seized a remote, but well-defended, CMC geological station. The CMC's military fragmented, nearly a third of its soldiers declaring loyalty to Gabriel and the Fallen." "Many of these holdouts (dubbed stragglers) were former miners driven to psychological breakdown by the pressures of long hours, horrible working conditions, and long-term exposure to raw kato residue, which had been demonstrated to have a corrosive effect on unprotected flesh even in particulate form, leading to respiratory ailments, skin rashes, and even blindness. Though the term 'straggler' was originally aimed at those who had remained in Avernus, it eventually grew to encompass anyone displaying these characteristics." Stragglers are Kato miners affected from exposure to the element and thus have a damaged mental state and deranged personalities. Sanjuro encounters them in a Pumping Station located near the Maratropa slums where they have captured a woman's cat. The owner of the cat controls an electrical fence that Sanjuro needs to get past in order to meet up with Kura, forcing Sanjuto to fight his way into the Pumping Station and through the Stragglers in order steal back the cat's toy, use it to call the cat once she is found, and then fight his way out again. Shogo: MAD, Characters, On-Foot, MCA (Mech), Factions, Enemies, Elements, Quotations, Guides, Community, Mods, Fan Artwork. This page was last edited on 29 December 2017, at 17:54.